This gorgeous cross Horseshoe charm beads easy to wear, sterling silver design prevent allergies, it symbolizes Faith and confidence and brings a gorgeous gift box, is the perfect gift for mom and daughter, ❤️ perfect combination of a cross and a horseshoe, fortunate for you❤️. Charm is a perfect combination of a cross and a horseshoe,Engraved"God All Things are Possible" Bible Verse This would be a great inspirational gift of encouragement for someone you loved reach a goal! The perfectly design makes this Religious Cross charm a wonderful gift for graduations, birthdays and christenings alike. Bible Faith Christian charm is a perfect choice for best birthday gifts, graduation gift, christmas gift, anniversary gift and wedding gifts, mother's day gifts, and valentine's gift. Delight your friends and family with gift they will love, gifts for mothers, gifts for wife, gifts for daughter, gifts for women, gifts for girls, and gifts for boys. The sterling silver Religious Cross charms comes in a beautiful jewelry box, with a polishing cloths, ready for gifting.Perfect gift for birthday to your favorite person. 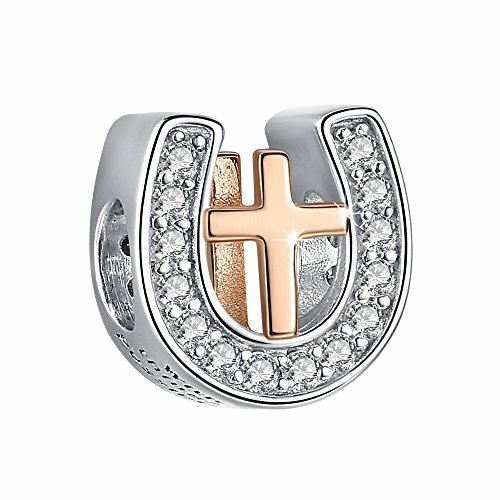 ✅Perfect fusion❤️Charm is a perfect combination of a cross and a horseshoe，If you are still hesitating and sad, this perfect charm will be your first choice, Lucky amulets will bring you luck. ✅Best Customer Service & 100% Money Back Guarantee❤️We value your shopping experience very much, so if you have any questons, please feel free to contact us, we will assure to give you a perfect solution. If you have any questions about this product by ANGELFLY, contact us by completing and submitting the form below. If you are looking for a specif part number, please include it with your message.